There is a lot of glamor surrounding startups raising funds but often times people forgot about the difficulties and challenges before each and single successful fundraise. Early-stage companies or startups focus so much on developing a good product that they neglect the need for adequate preparation for fundraising campaigns. 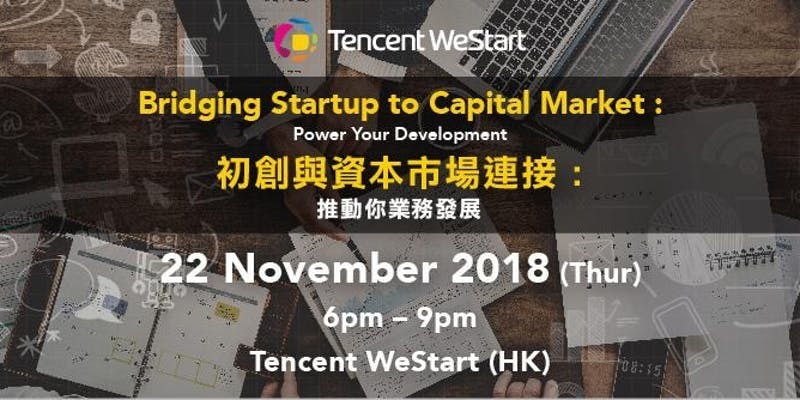 Tencent WeStart (HK) is here to help! Our new Business Strategy and Advisory team can assist you the basics of evaluating your strategy and readiness, to helping you identify the most suitable investors, to even assist you in preparing your IPO journey. This is an exclusive opportunity for any startup who is looking to expand! Members of WeStart HK can even receive a complimentary one-on-one health check assessment after this session. For those who are not members yet, attend this event to get discounted membership rates and access! Registration begins at 6pm and event starts at 6:30pm. RSVP NOW to save your seat!